Rockin Baja Lobster offers Happy Hour at each of their restaurant locations; Gaslamp Quarter, Mira Mesa, Oceanside Harbor, San Diego’s Old Town & Newport Beach. Available in the Bar (& Bar Patio where available) only. Prices Valid for Dine in only. Menu offerings always subject to change. Each location may have slight variations in product & price. 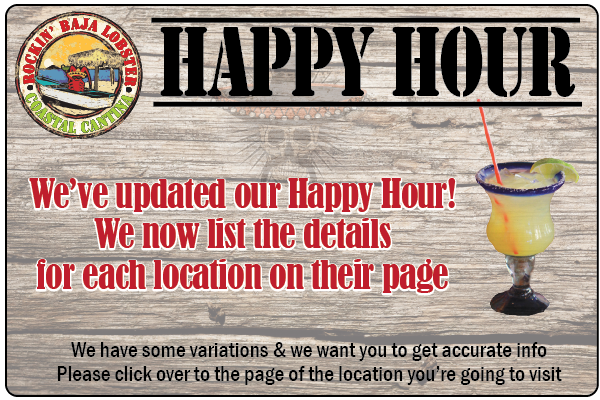 Please the the menu for the location you are visiting to see the most accurate Happy Hour offerings and menu features.